Habit: Annual, perennial herb, < 2 m; sap clear or milky; monoecious. Stem: erect. Leaf: alternate, entire or toothed; stipules minute, petioled; blade base generally with 2 glands. Inflorescence: spike, axillary or terminal; bracts glandular. Staminate Flower: calyx 2-lobed; stamens 2; nectary disk 0. 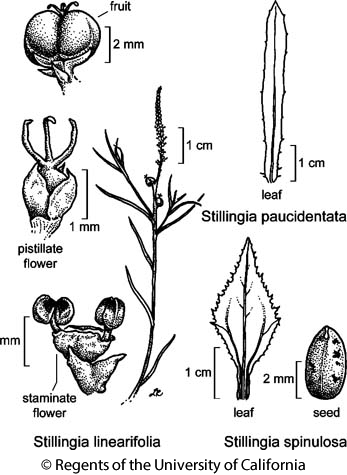 Pistillate Flower: sepals 3, overlapping in bud, reduced, or 0; ovary 3-chambered, styles free, fused proximally, lobes 0. Fruit: generally 3-lobed, separating into 3 1-seeded segments; central axis persistent. Seed: pointed; scar not appendaged. Habit: Perennial herb < 7 dm. Leaf: blade 1--4 cm, < 2 mm wide, linear, entire. Inflorescence: 2--7 cm, terminal; glands of pistillate bracts stalked, +- 1 mm. Pistillate Flower: 3--6 per inflorescence, well separated; styles +- 1 mm. Fruit: +- 3.5 mm. Seed: +- 2 mm, smooth. Citation for this treatment: Mark H. Mayfield & Grady L. Webster 2012, Stillingia linearifolia, in Jepson Flora Project (eds.) Jepson eFlora, http://ucjeps.berkeley.edu/eflora/eflora_display.php?tid=45629, accessed on April 21, 2019. SnJV (Monocline Ridge, Fresno County), SW, D; Markers link to CCH specimen records. Yellow markers indicate records that may provide evidence for eFlora range revision or may have georeferencing or identification issues. Purple markers indicate specimens collected from a garden, greenhouse, or other non-wild location.